Go Karts, Paintball & More! FOXBOROUGH, Mass. — World-renowned Grammy Award winning DJ/producer Diplo will host his newest live, curated event, Diplo Presents The Super Mega Ultra Giant Mad Decent Block Party Festival, Saturday, July 20 and Sunday, July 21 at Gillette Stadium in Foxborough, Mass. This massive music and entertainment festival is the only MDBP event in North America this year. 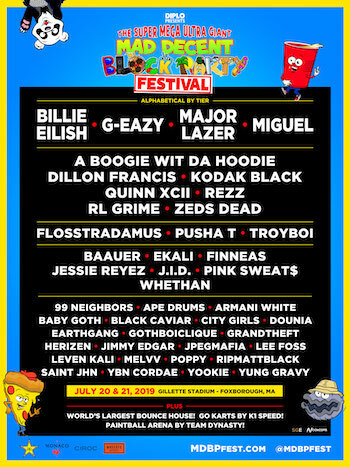 MDBP Fest will feature three music stages — The Block Party Stage, located on the Gillette Stadium field, The Super Mega Stage, and The Ultra Giant Stage — with performances from Billie Eilish, Major Lazer, G-Eazy, Miguel, A Boogie Wit Da Hoodie, Dillon Francis, Rezz, and many more. MDBP Fest will also feature a number of activities, games, and activations, including The World's Largest Bounce House, go karts, and paintball throughout the Gillette Stadium and Patriot Place campus. THE WORLD'S BIGGEST BOUNCE HOUSE: Prepare to kick off your sneakers and release your inner 6-year-old in The World's Biggest Bounce House. Making its festival debut at MDBP Fest, Big Bounce America brings its 10,000-square-foot, candy-colored wonderland to the party. This inflatable paradise has room for 200 people and features giant sized ball pits, climbing towers, slides, obstacle courses, and basketball hoops, with a fully-equipped stage and DJ booth located right in the very center of it all. PAINTBALL: Who doesn't like a good game of paintball to round out their festival experience? Come and compete against your friends and fellow festivalgoers in MDBP's paintball course, brought to you by Team Dynasty. Gillette Stadium hosts a multitude of music and sporting events and is the home stadium for both the NFL's six-time Super Bowl Champion New England Patriots and Major League Soccer's New England Revolution. Located at One Patriot Place in Foxborough, Mass., Gillette Stadium is about 30 miles southwest of downtown Boston, 20 miles northeast of downtown Providence, and a day trip from most of New England. Boston Logan International Airport (BOS), T.F. Green International Airport (PVD), and Boston's South Station (train/bus) are easily accessible for those traveling from other parts of the U.S. and globe to attend the festival. Orange County, California based Synergy Global Entertainment, Inc. (SGE) is one of the world's premier music festival production companies. SGE events include music and lifestyle festivals across a variety of genres and interests, with over 100 major festival dates planned for 2019. SGE produces or co-produces Back To The Beach; Big Adventure; Driftwood; ID10T Music Festival + Comic Conival; Knotfest; Lost Lands (Your EDM Best Festival of 2017 and Noiseporn 2017 Festival Of The Year); Moonrise Festival; MUSINK; Ohana Dana Point; Sabroso Taco, Craft Beer & Music Festival; Scallywag! ; Surf City Blitz; 92.3 WCOL Country Jam + Campout, and more. In addition, SGE co-produced the Rockstar Energy Drink Mayhem Festival and the worldwide Rockstar Taste of Chaos, and created and produced the Identity Festival, Oddball Comedy and Curiosity Festival, and Rockstar Energy UPROAR Festival. This year's SGE-affiliated events are projected to sell over 1.2 million tickets. In addition to festival production and promotion, SGE's in-house sponsorship agency procures and executes a multitude of partnerships in varying forms for global brands, top-tier artists, international booking agencies and more. Gillette Stadium, located in Foxborough, Mass., is New England's premier sports and entertainment venue. The 65,878-seat stadium is the full-time home of the NFL's six-time Super Bowl Champion New England Patriots, which have sold out every home game at Gillette Stadium since the venue opened in 2002. Gillette Stadium is also the home field of the New England Revolution of Major League Soccer and one of the world's top grossing concert venues, according to Billboard and Pollstar. Other notable sporting events held at Gillette Stadium include the 2016 NHL Winter Classic, international soccer matches, NCAA athletics, professional lacrosse, motor sports and the Massachusetts high school football state championships. For more information, visit www.GilletteStadium.com or follow @GilletteStadium on Twitter, Instagram and Facebook.